California agreed with my dad. Within five years of moving west with his mother, he went from being the kid from Brooklyn wearing knickers to being the young man pictured here. 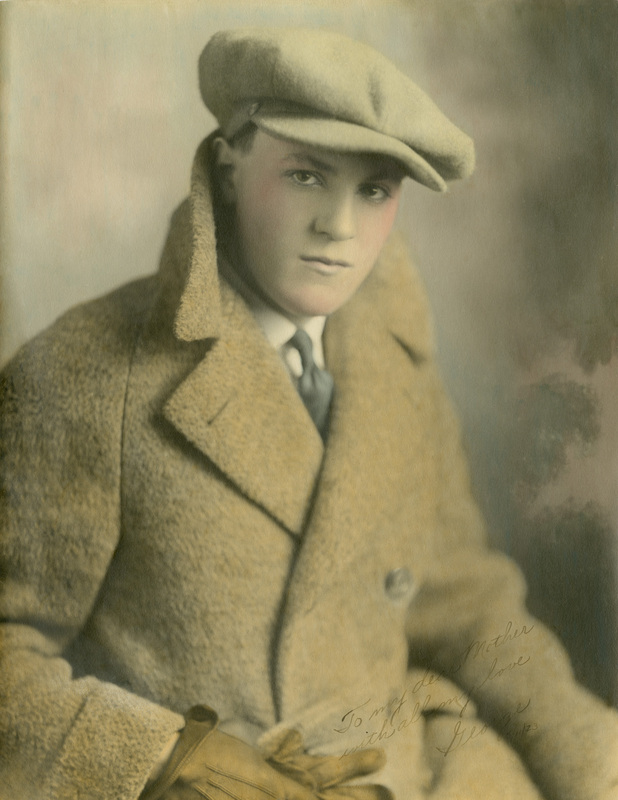 He’s 20 in this spectacular, hand-colored portrait, taken in San Francisco in December 1922. (View a larger version.) This is one of his first publicity photos. He had recently begun performing as a singer and actor, a career he’d have until the late 1920s, when he’d feel the pull of a new medium called radio. This portrait was a gift to his mom, a present from a son who would soon be hitting the road with traveling theater companies. I’m guessing the photo ended up with my dad after his mother died. For a photo that’s nearly 100 years old, this portrait’s original is in great shape. (Thank you, mama, for storing these safely for so many years.) It’s a bit faded and has a bad crease and some other physical damage, but has otherwise stood the test of time. The bigger challenge in digitizing this one is the fact that the original is large: at 11 by 14 inches, it was too big to scan in one pass on my Epson flatbed scanner. So I scanned it in two passes, making sure there was lots of overlap between each half. Then I stitched the two halves together using Photoshop. With many flatbed scanners, the plastic frame around the scanner’s glass is at almost the same plane as the glass itself. This enables you to position original artwork so that part of it extends outside of the scanner and then close the scanner’s lid—without creasing the original. As for stitching the two halves together, my research revealed a lot of techniques. Many online tutorials tell you to manually assemble the two halves, temporarily lowering the opacity of one of the halves so you can see the matching part of the other half beneath it, then fine-tuning the position of each half so they match up. And more the point, this technique doesn’t work well: oftentimes, the two halves won’t line up perfectly because of optical distortion and differences in scanning exposure between the two halves. An easier and better solution involves Photoshop’s Photo Merge command. This is the feature that lets you stitch multiple photos together into a panorama, but it also works beautifully for tasks like this. When you look at how Photoshop blended the two halves, you can’t help but be impressed with the power of this software. After Photoshop did its work, it was my turn. I used the usual tools—clone stamp, healing brush, and patch—to fix the crease and other damage. The portrait’s colors have shifted over 90 years, but I chose to not correct them. I love the warmth. But I did use a Levels adjustment layer to punch up the brightness and contrast a bit to address the fading. The end result is a portrait I think my dad—and his mother—would be proud of.